Now this is how you adapt an ultra-violent comic book franchise. No Sly Stallone (sorry Sly!). No Rob Schneider. No taking off the helmet. No, you just have another day on the job for one of the baddest judges around. The film is set in a dystopian future where a lot of the world is a wasteland, and the parts that aren't are covered in sprawling megacities. Of course, when you have that many people living right on top of one another, there's going to be crime and simple cops won't cut it. You need judges. One man wrecking crews that are judge, jury and executioner when it comes to fighting crime. They're clad in combat gear and visually striking helmets and are armed with Lawgivers, which are basically super pistols that can shoot several types of rounds and are the judges best friend when it comes to taking out perps. 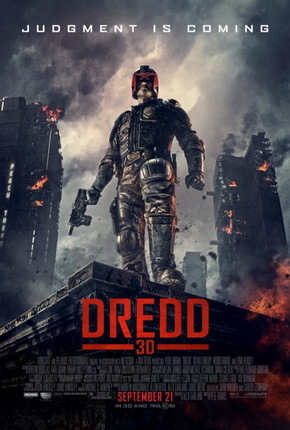 The action is this movie is sublime, as Dredd wages war on a gang in the heart of a block of Mega-City 1. Karl Urban is stoic and angry and simply awesome as the title character and Lena Headey is magnificent as Ma-Ma, the head of gang that is terrorizing that particular sector. Unfortunately, I didn't get to see it with 3d, but I can imagine from the way the 2d version looked that the added dimensions would look stellar, with plenty of bullets whizzing around and explosions and bodies hitting the ground. It's fun, it's serious, it's serious fun. Best of all, it brings back the gravitas and respectability that the Stallone movie squandered by turning itself into a buddy movie. It didn't do too well in the theaters, probably because people remember the earlier version with scorn, but it seems to be recouping a bit of its sales on video, so here's hoping for a sequel. Because I need to see Judge Death. Make Karl Urban Judge Dredd for the next twenty years. Happy New Year, 2013 Edition!